Like the mannitol salts agar, the coagulase test is another method for differentiating between pathogenic and non-pathogenic strains of Staphylococcus. Bacteria that produce coagulase use it as a defence mechanism by clotting the areas of plasma around them, thereby enabling themselves to resist phagocytises by the host's immune system. The sample is usually incubated at 37 degrees Celsius for one to four hours. A positive test is denoted by a clot formation in the test tube after the allotted time. Place a drop of distilled water on a slide. Emulsify the test strain to obtain a homogenous thick suspension. False negative reactions will occur of the bacterial suspension is not heavy enough. Dip a straight wire or loop into the plasma. Mix gently with the homogenous suspension. 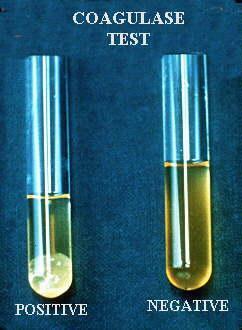 Strains which auto-agglutinate must be tested by an alternative procedure. Negative result no visible clumping within 10 seconds.